The Freer Gallery of Art houses the Asian and impressionist art collection of Charles Lang Freer, who donated art works and an endowment to the Smithsonian in 1906. 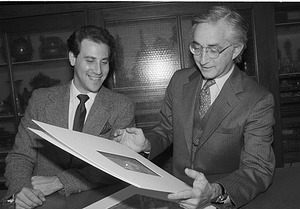 In 1982, Arthur M. Sackler donated a complementary collection housed in the Sackler Gallery in the Smithsonian Quadrangle Complex adjacent to the Freer. History of the Freer Gallery of Art and the Arthur M. Sackler Gallery. 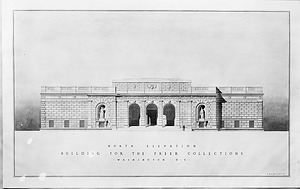 Architectural sketch of the North Elevation, Building for the Freer Collections, Washington, D.C. 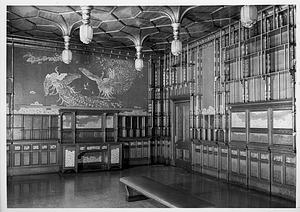 The Freer Gallery of Art was designed by Architect Charles A. Platt. 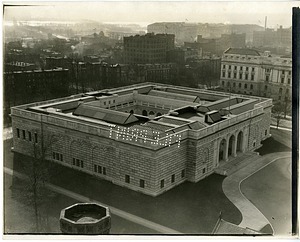 The ground-breaking for the Freer Gallery of Art on September 23, 1916. A crowd of people has formed a semi-circle to observe the event. While not all of the individuals are identified, several names are listed on the back of the print, including: H. W. Dorsey, C. R. Aschemeier, J. S. Pollock, Joseph Mace, George T. Mace, Richard Rathbun, Ms. M. V. Young, James G. Traylor, Charles Greeley Abbot (fifth Secretary of the Smithsonian Institution, 1928-1944), E. L. Springer, D. L. Stejneger, and Ms. M. E. deRonceray. 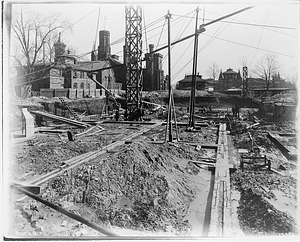 Laying of the foundation for the new Freer Gallery of Art, March 6, 1917. 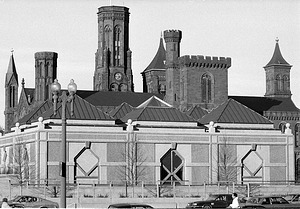 Visible in the background is the brick shed of 1875 called the Laboratory of Natural History, the Smithsonian Institution Building, and the Arts and Industries Building. The shed was demolished during the course of construction work. The Freer building was designed by architect Charles A. Platt. An aerial view of the north and east fronts of the Freer Gallery of Art shows construction debris on the ground around the two fronts of the Freer Gallery. The Department of Agriculture building at the corner of Independence and 12th Street is to the west of the Gallery. In the distance on the left can be seen the Potomac River. Homes, other buildings, a smokestack and clock tower can also be seen. 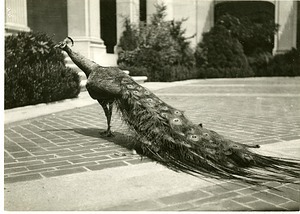 During the summer starting in 1923, one of the three peacocks loaned by the National Zoo is in the courtyard of the Freer Gallery of Art. 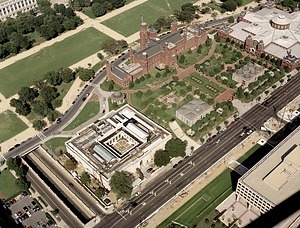 This is an aerial view of the Freer Gallery of Art, looking south. Trees surround the Freer. Twelfth Street runs along the building to the right. 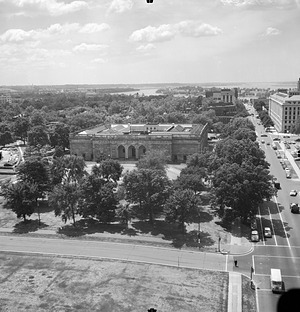 The Department of Agriculture building is to the right at 12th and Independence Avenue and the Potomac River can be seen in the distance. The Empress Nagako escorted on a tour of the Freer Galley of Art (FGA) by Dr. Harold P. Stern and Mrs. Ripley October 2, 1975. 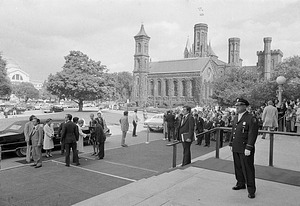 The Empress is being greeted in the center of the photograph in front of a limousine, before approaching the stairs to the Freer Gallery of Art. A carpet has been rolled-out for The Empress. 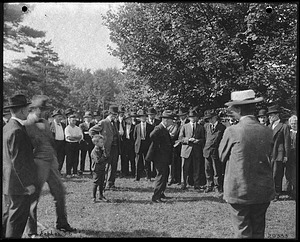 On the right-hand side of the photograph is a crowd of people. In the background, the vine-covered Smithsonian Institution Building (SIB), or "Castle," the National Museum of Natural History (NMNH) in the Natural History Building (NHB) across the tree-covered mall and numerous cars and visitors are visible. 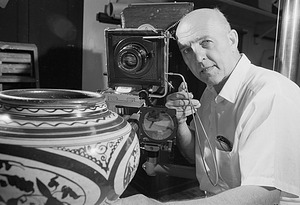 Ray Schwartz, Freer Gallery of Art (FGA) photographer, photographing an object from the collection. 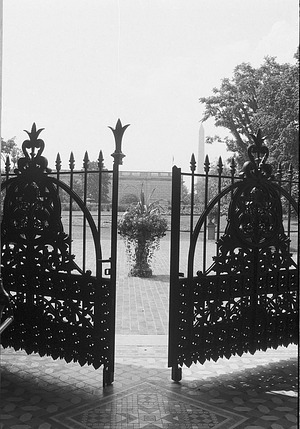 This set of elaborate iron gates, one of four pairs created in 1879 to adorn the entrances to the United States National Museum, were reinstalled outside the west door to the Arts and Industries Building in September 1979 after extensive restoration, following their discovery in Tennessee and return to Washington, D.C. This photo looks out through the gates onto the Victorian Garden with the Freer Gallery of Art in the distance and the Washington Monument. 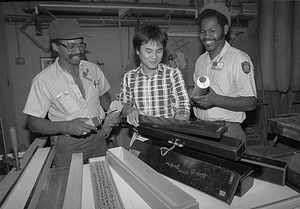 Cornell Evans, Ryo Nishiumi and John Marshall with paulownia wood they use to make storage boxes for the Freer Gallery of Art's Oriental Scrolls. The boxes must be technically perfect to ensure an effective seal against humidity. The craftsmen also use the paulownia to make "futomaki" - a special type of protective roller - which must be custom fit for each scroll to prevent the delicate paper or silk from becoming creased. 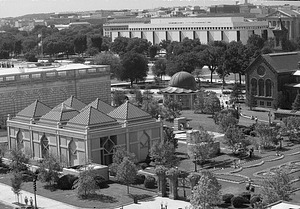 Looking down from the tallest tower of the Smithsonian Institution Building towards Independence Avenue, view is of the Quadrangle (South Yard) construction site for the future home of the Arthur M. Sackler Gallery, the National Museum of African Art and the S. Dillon Ripley International Center, an underground museum and research complex. The pit has been dug and the construction of the building is in its early stages. The South Tower of the Smithsonian Institution Building is in the foreground, and the Forrestal Building is in the background. Arthur M. Sackler Gallery's (AMSG) Glenn Lowry and Milo Beach examining a document from the treasury of Persian and Islamic paintings and manuscripts recently acquired by the Smithsonian Institution. They were the first scholars in forty years to be able to see these artifacts. South side of the Arthur M. Sackler Gallery (AMSG) pavilion with pyramided roof. 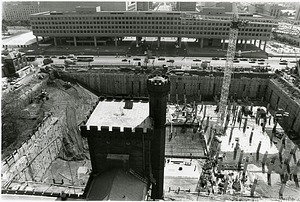 The towers of the Smithsonian Institution Building (SIB), or "Castle," are visible in the background. View of Arthur M. Sackler Gallery pavilion with pyramided roof located at the Smithsonian Institution in the four-acre Enid A. Haupt Garden, formerly known as the South Yard. The Sackler Gallery along with the National Museum of African Art and the S. Dillon Ripley International Center opened to the public on September 28, 1987. On the left is the Freer Gallery of Art and the National Museum of American History in the distance. 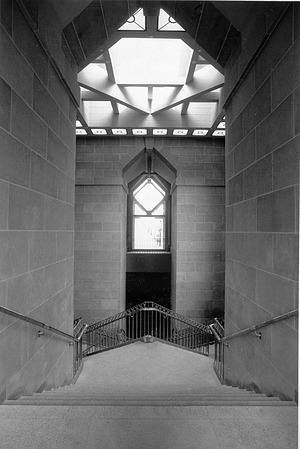 The view down the grand staircase of the Arthur M. Sackler Gallery. Note the repetition of the diamond motif. The museum houses Asian art and opened as part of the Quadrangle complex on September 28, 1987. Smithsonian Contributing Membership Reception at the Arthur M. Sackler Gallery. 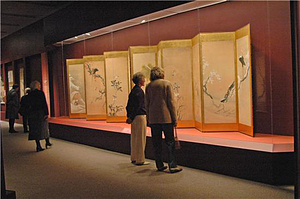 Visitors are viewing an exhibit of Japanese screens.